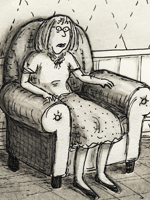 New Yorker cartoonist Roz Chast will bring an evening of humor to Syracuse University on Wednesday, March 5, as she offers her unique and witty perspective on the happenings of everyday life in the next University Lecture. Chast will speak on “Theories of Everything and Much, Much More,” as well as share visual selections from her vast body of work, at 7:30 p.m. in Hendricks Chapel. The lecture is free and open to the public; reduced-rate parking is available in Irving Garage. American Sign Language (ASL) and Communication Access Real Time (CART) interpretation will be available for this lecture. Since she sold her first cartoon to the New Yorker in 1978, Chast has established herself as one of our greatest artistic chroniclers of the anxieties, superstitions, furies, insecurities and surreal imaginings of modern life. Her work encourages the reader to not take life’s challenges too seriously. Since then, nine collections have been published of Chast’s work, most recently, “Theories of Everything,” (Bloomsbury, 2008), a 25-year retrospective. She is currently working on a book that chronicles her relationship with her aging parents as they shift from independence to dependence. Using handwritten text, drawings, photographs and her keen eye for the foibles that make us human, Chast addresses the realities of what it is to get old in America today—and what it is to have aging parents today—with tenderness and candor, and a good dose of her characteristic wit. The final two lectures in the 2013-14 season are playwright and activist Anna Deveare Smith on “Snapshots: Portraits of a World in Transition,” Tuesday, March 25, at 5 p.m.; and education advocate and professor Diane Ravitch, “The Death and Life of the Great American School System,” Tuesday, April 1, at 7:30 p.m. The Office of University Lectures welcomes suggestions for future speakers. To recommend a speaker, or to obtain additional information about the University Lectures series, contact Esther Gray in the Office of Academic Affairs at 315-443-2941 or eegray@syr.edu. More information can be found at http://facebook.com/home.php#!/universitylectures.